Welcome to The Steamship Sir Walter Scott’s August 2018 e-newsletter! We at Loch Katrine hope that this issue of our electronic newsletter finds you all well and are enjoying the fine sunny weather that we have been having. Sorry that you haven't heard from us before this but with the new GDPR rules and also a really busy start to the season we are running a wee bit late! A lot of work has been going on to update and renovate the Steamship Cafe with new menu, seating, lighting and special afternoon tea option. We are open for breakfast from 09:00hrs and serve hot food untill 17:45hrs - during the autumn and winter the hours will change - details can be found on our website www.lochkatrine.com. We had the official opening of our Eco Camp in June and are delighted and a wee bit humbled by the response from people staying. There are more details below - why not book your visit now! Fingers crossed the stunning weather continues as we have had some amazing days out on the loch. The loch is as low as anyone has seen in the last 5 years at least! There are also a number of special events planned for the year with Music, Fireworks and Santa all making an appearance at Loch Katrine - dates for you diary are below. Over the years the team at Loch Katrine see a number of people over the course of a year and often see these people returning year after year, we think that our newsletter is a great way of keeping in touch as well as the ideal medium to highlight some of the efforts made to keep the Sir Water Scott and the other vessels running year after year; so do pass this on to your friends and contacts! We really hope that you enjoy this and would welcome any feedback. The Official Opening of our Eco Camp. We had the grand opening in June with our local MSP, Bruce Crawford and Chair of Scottish Natural Heritage and Mike Cantley - as well as Lady Drummond (our team member Caitlin). Here are some quotes from those invited to the opening. "New eco camp opens on the shores of Loch Katrine where some of the first early travellers to Scotland stayed in wicker and bracken huts in the late 1700s and early 1800s. " At the turn of the 18th century when literary giants such as Sir Walter Scott, the Wordsworths, and Coleridge ventured on some of their epic journeys to discover ‘the raw beauty of Scotland’s scenery, they sheltered in what were described as ‘rudimentary huts with bracken roofs at the eastern end of Loch Katrine’ and their writings subsequently led to Scotland’s first tourism boom." A couple of huts were provided by Lady Drummond of Perth, the local landowner, who was concerned to ensure there were shelters for these early travellers drawn by the sheer beauty of Loch Katrine which Sir Walter Scott described as ‘’the scenery of a fairy dream’’ in his blockbuster poem Lady of the Lake, published in 1810. Next to the spot where these huts stood, an imaginative venture by the Trust charged with sustaining the 119 year old Steamship Sir Walter Scott, has led to the development of a cluster of more luxurious eco timber lodges and a small camp ground in the shadow of Ben Venue on the lochside. This is part of the Great Trossachs Forest National Nature Reserve and a designated Site of Special Scientific Interest in the heart of the Loch Lomond and The Trossachs National Park. Billy Petrie OBE, Chair of the Steamship Sir Walter Scott Trust explained: ‘’ This is an unusual, but essential, investment by the Trust as we strive to diversify our income streams to support the continued operation of the historic Sir Walter Scott Steamship which is expensive to maintain and brings so much pleasure to tens of thousands of visitors each year." The new eco camp, which consists of 8 eco lodges (4 en-suite and 4 standard), 8 camping pitches, a shower and toilet block and some campervan stances with electricity, water and wifi hook ups, has been designed in a very careful way with strong eco credentials given its location in an environmentally sensitive site so close to what is a major reservoir supplying, as it does, over 150 million gallons of water daily to households in Glasgow and Central Scotland. Dr Michael Cantlay, Chair of Scottish Natural Heritage and Bruce Crawford, MSP for Stirling have both been strong supporters of the Steamship Sir Walter Scott Trust over the years and they officially opened the new Loch Katrine Eco Camp today (Monday 18th June). Dr Cantlay, said: "This is a really bold investment by the Trust and one which I wholeheartedly endorse as it has led to the creation of much needed high quality glamping facilities in a stunning environmental setting where Scottish tourism began a couple of centuries ago." Bruce Crawford, MSP for Stirling played an important role in helping to secure the future of the Steamship 12 years ago when a £1.75 million funding package was secured from the Scottish Government and Scottish Water for major refurbishment work and he has welcomed this latest move to provide tourist accommodation at Loch Katrine as part of strengthening income streams to sustain the Steamship operation. The new eco camp was funded by the Trust from trading reserves and a £50,000 grant from Forth Valley & Lomond LEADER programme and has the triple aims of capitalising on the growth in demand for glamping, contributing to the National Park Authority’s current camping initiative as well as generating an important new income stream to support the historic steamship." In July we had our second annual Pirate day with the Walking Theatre Company on the Lady of the Lake and the Steamship Sir Walter Scott. We all had fun dressing up as pirates and welcomed adults and children alike all dressed in their best pirate outfits. We had a terrific weekend which saw the pier absolutely buzzing with activity and lots of people searching for our hidden treasure chest. As part of this we ran a competition for the best Pirate picture taken beside our photo board. The prize was a night in one of our Eco Lodges. The competition was won by Heather with this photo. Congratulations Heather, we hope you enjoy your stay with us. The Steamship Cafe and Model of the Sir Walter Scott. In July we welcomed Bill Perbody to Loch Katrine; Bill is an extraordinarily patient person who built a highly detailed model of the Steamship Sir Sir Walter Scott over 21 years, a real labour of love. The model shows the steamer before the 2009 renovations and is highly detailed down to the individual rivets on the portholes and pulleys on the life boat daviots at the rear. Bill has donated the model to the Trust so that it can be displayed in pride of place at it's spiritual home. We are very grateful to Bill and his family for their support. Do make sure that you have a look the next time you are visiting! The Loch Katrine Story, Storyboards. One of our winter projects was to update the interpretation panels along the pier with details of the ship, area and also the water supply. The new panels are up and already have proved popular with passengers reading them or just even looking at the pictures. The Chair of our trustees, Billy Petrie OBE with one of our new panels. The story boards tie in nicely with some history from our archive by Joyce, this is a repost from the last newsletter but it does tie in with the new story boards and the history of the loch. Some History from the Archive. Here at Loch Katrine we are lucky to have a wealth of archive material and many photographs relating to the history of the area. One of the most notable events occurred on the 14 October 1859. As the Rob Roy ll sailed up Loch Katrine, church bells rang out all over Glasgow and cannons were fired from the ramparts of Stirling Castle. Two of the passengers on board the Rob Roy were Queen Victoria and Prince Albert who were being taken to Stronachlachar. They were met by over a thousand onlookers and guests and two boatmen, John McDonald and Peter McGregor who had worked on Loch Katrine for over 50 years. They transported the royal party by rowing boat to the newly built aqueduct tunnel where the Queen was to pull the handle on one of the sluice gates to open the tunnel which would send millions of gallons of fresh highland water through 26 miles of aqueducts, tunnels and pipes to the reservoir at Mugdock. After the opening ceremony she was relieved to enter Royal Cottage to escape the rain and enjoy the ceremonial lunch. The Royal Train had arrived at Callander Station that morning and the Royal Party walked through, a newly built arch covered in heather and Royal Stewart tartan, the first of many they would pass through, on their way to Loch Katrine. Today you can still see some of the black and white cast iron mileposts which were also built along the route. In the early nineteenth century Glasgow suffered two major outbreaks of cholera. The city had no piped water supply and its citizens had to collect their water in in pails and jugs from public and private wells. The city council employed John Frederic Bateman, an experienced engineer, to design a water supply. Other projects he is known for include the waterworks of Manchester, Belfast and Dublin. He also was known for engineering schemes abroad, including a dry dock in Halifax, Nova Scotia. He had such an esteemed reputation that he was invited to the opening of the Suez Canal. The building of the Glasgow Waterworks took nearly 4 years to complete and was one of the largest building works in the country. Work began in the spring of 1856 and a tunnel was cut into the mountain to take the water from Loch Katrine to the Loch Chon side. Over 3,000 were employed on the project and a timber village was constructed on Loch Chon to accommodate the workforce. This temporary village was nicknamed ‘Sebastapol’ due to the continuous noise from the blasting. The project was such a success that later work was carried out to increase the water supply as Glasgow’s population increased. A second aqueduct was built linked to a reservoir at Craigmaddie and the level of the loch was raised three more times so that it is now 17 feet above its original height. Not everyone was happy with the arrival of fresh water in Glasgow though. One elderly woman continued to draw her water from the wells, water which was often the colour of sherry. We are active on Facebook, Twitter and Instagram so do please feel free to share your experiences with us. We love to see and share your photos of the loch and the area surrounding the loch. You will also see what the crew on the boats and on shore get up to throughout the year and be the first to hear of special offers for sailings and the Eco Lodges. 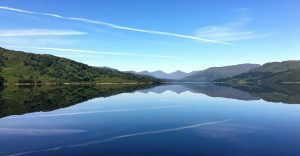 Over the years there have been a significant number of residents in the various properties around the loch who are always happy to share thier experiences and stories from thier time here at Loch Katrine. With that in mind, if you have any old pictures, postcards and memories to share with us and don’t mind them being showcased on social media please let us know on enquiries@lochkatrine.com or via Facebook and Twitter. Our local photographers have also been really busy posting some stunning shots on our Facebook feed. So massive thanks to John McSporran, Phil Crowder and Peter Chisholm for sharing. Why not give them a follow on their Flicker or Facebook pages. Links are embedded in thier names. Do feel free to join in with our online community! The Lodges have proved to be really popular with our guests enjoying the peace and quiet of the Trossachs and Loch Katrine. Trossachs Pier is the ideal base for exploring the east side of the Loch Lomond and Trossachs National Park. The Steamship Sir Walter Scott leaves from Trossachs Pier and is the ideal way to start your exploration of the surrounding area. There are many walks locally that are worth doing such as Ben A'an and the Great Trossachs Forest Path. Details can be found from Walk Highlands. Other attractions close by include, Callander, Stirling Castle, Wallace Monument and Blair Drummond Safari Park. We have eight lodges sleeping from 2 to four people. More pictures are available on our website. The lodges are built to the highest of standards by Lune Valley Pods. Each of the Lodges is fully insulated, heated and come fitted with new double glazing, so each lodge is nice and cosy especially during autumn and winter stays. The en-suite Lodges are named after our nearest local lochs, Loch Arklet, Loch Achray, Loch Venachar and of course, Loch Katrine. Loch Arklet Lodge is a specially designed accessible lodge with parking nearby and en suite facilities. There are two en-suite lodges which sleep 2 people in a double bed and 2 in a fold down king sized bed. These are named Loch Achray and Loch Venachar. We allow dogs in Loch Venachar. Our luxury lodge is Loch Katrine; set higher than the others with a fully glass front affording spectacular view over Ben Venue. Loch Katrine lodge sleeps two in a king sized bed. The en-suite lodge price includes bed linen and towels. Each lodge has of course en-suite facilities with walk in electric shower, kitchenette with combo microwave, fridge and sink, free view HD TV; free Wi-Fi, lighting and under floor heating. We offer a 20% discount on sailings on the Steamship Sir Walter Scott or Lady of the Lake and also on cycle hire. Prices start from £80.00 per night for 2 people with a minimum stay of 2 nights. Loch Katrine lodge is £95 per night. We offer options for Welcome and BBQ packs, breakfasts in the cafe, BBQs and our Romantic Welcome Pack, details on the booking website once you have selected your dates. We also offer four lodges with shared facilities. Named after the mountains surrounding Loch Katrine, Ben A'an, Ben Venue, Ben Ledi and Ben Lomond. We allow dogs in Ben A'an and Ben Ledi. These each sleep 2 in a double bed and 2 in bunk beds. There is a small kitchenette with combo microwave, fridge and sink; freeview HD TV; free Wi-Fi, heating and lighting. There is the use of nearby toilet and shower facilities. Linen hire is available. We offer a 20% discount on sailings on the Steamship Sir Walter Scott or Lady of the Lake and also on cycle hire. Prices start from £40.00 per night for 2 people. Book your short break now by visiting our website. We have had some great reviews too! More can be found on our Facebook page. "Wow wow and wow!! Staying at the eco lodges, what an amazing piece of heaven! This place is beautiful, first impression does not disappoint. Driving up to the car park we can see the hustle and bustle of people walking about with the steamships in view. Checking in was a breeze, the ladies whom checked us in were lovely and helpful. Once we passed the reception/booking office, we drove the short distance to our designated parking space for the eco lodge. The lodge was just a few feet away. The area is spotless, so beautiful and tranquil. Our lodge did not disappoint, it was spotless, smelt lovely, with clean cutlery and crockery. We also had a wee welcome pack of tea and coffee, which was a nice surprise. The lodge is well thought of with a combi microwave, toaster, kettle, with a sink and running water. The bed and bunk beds are comfortable, the lodge was so nice and cosy. The lodge was warm, and we were able to open up the window with the midge net in place which helped, although the odd sneaky midge did get through! A massive thanks to Linda, housekeeping, very pleasant, knowledgeable, friendly, hardworking lady, whom explained about everything we needed to know about the lodge and surrounding area. Our lodge overlooked the loch and can see the steamships departing and arriving, absolutely beautiful watching these ships pass from the comfort of your lodge. During our stay we went for a couple of walks and bike rides in and around the area. The scenery is amazing! We hired our bikes from KatrineWheelz and the staff were very friendly and helpful. The Steamship cafe is lovely, we decided to book afternoon tea but because we had a dog we had to eat outside. This wasn't an issue and the manager was very accommodating, if the weather conditions were to turn to rain for the following day, then the manager advised that they would put up one of their parasol umbrellas. Also as I'm the only vegetarian in our family, the manager again took our sandwich order for the afternoon tea. Again this place doesn't disappoint, and as promised the parasol umbrella was up due to light rain in the morning, the manager greeted us with his friendly smile when we arrived and promptly brought out our order of afternoon tea. The afternoon tea was lovely, i had vegetarian sandwiches, whilst the rest ate meat sandwiches and the scones and cupcakes are to die for!! (I'm sorry we didn't get the managers name but please pass on our thanks to him for his professional friendly helpful attitude, we enjoyed our afternoon tea). We also had breakfast at the cafe and it was so fresh and delicious, especially the vegetarian breakfast for me! Whilst staying at Loch Katrine, we decided to take the 2 hour return journey to stronachlachar on the Sir Walter Steamship. The steamship was lovely, the scenery is amazing, the staff are friendly and enjoyed the whole experience as did our daughters and dog. Eco lodges, is a little piece of heaven, so quiet, clean, tidy and relaxing. One of the best places we have stayed at, so much so we've already booked up to stay again next year and can't wait!! Massive thanks to all the staff at Loch Katrine, we have enjoyed our few days away and don't want to go home!!!" " Just returned from a midweek break at the new en-suite eco pods with my partner and our 2 westies. The pods are amazing and are very comfortable a true home from home in a stunning location. The staff were all very welcoming and friendly. I would highly recommended a visit. " These and other reviews can be found on our Facebook Page. We continually update our website with new pictures and information, as well as the 2018 timetables. You can now book your sailings on-line, including the fireworks cruise and view and book your stay in our Eco Lodges on line as well, all from the website. We also have festive cruises planned where you can meet Santa as well as New Year music cruises on the frist and second of January. More events are planned keep your eye on our website for detail, dates and prices.